In 1973, which was Jackon’s first Series, he almost single-handedly beat the New York Mets greatest pitcher, Tom Seaver in the sixth game of the Series. The A’s were down, three games to two. In those days, it was a game the A’s had to win. Today, it is an “elimination” game. Jackson had three hits in four at-bats off Seaver, including run scoring doubles in the first and third innings in a 3-1 Oakland win. The next day, against left-hander Jon Matlack, Bert Campaneris hit a two-run third inning home run to put the A’s up by two runs. After Joe Rudi singled, Sal Bando popped up but Reggie blasted a two-run home run for a 4-0 lead on the way to the World Championship. The 1977 World Series established Jackson as one of the greats. The Cincinnati Reds had swept the Yankees the year before, which brought the Yankees losing streak to three (1963,1964 and now, 1976). Mr. Steinbrenner considered that unacceptable, as did most Yankees fans, which was a primary reason the Yankees signed Jackson. The Dodgers won the fifth game, forcing the teams back to Yankee Stadium for the sixth game. In his last at-bat in the fifth-game loss, Jackson hit a home run off Don Sutton that seemed meaningless, but which became significant two days later. Jackson walked the first time he faced Burt Hooten with the Yankees trailing, 2-0. 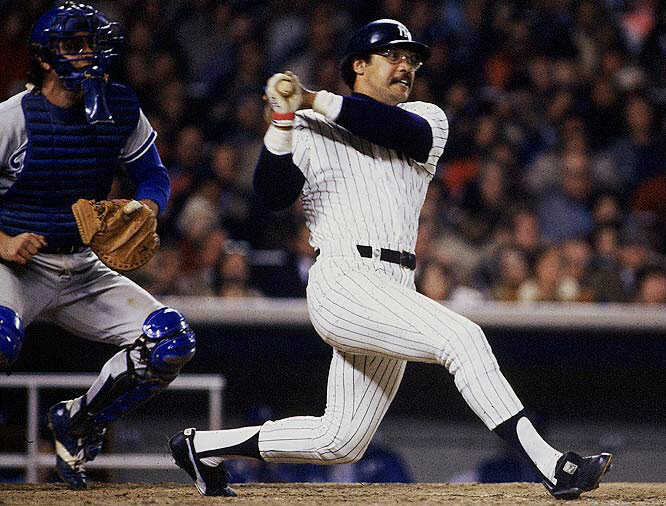 Chris Chambliss tied the game with a home run off Hooten. The Dodgers were leading by run when Jackson hit the first of his home runs in the fourth inning, following a Munson single, to give the Yankees a lead they never relinquished. In the fifth inning, Elias Sosa served up Jackson’s second home run and in his final at-bat, Jackson led off the eighth inning with a 475-ft shot into center field off Charlie Hough, which was Mickey Mantle territory. On one level, it’s unfair to judge player’s on their World Series performances because many great players such as Ernie Banks, Ralph Kiner, Ken Griffey Jr., Frank Thomas and Rod Carew played on teams that never won a pennant during their tenure, but no games are more important than World Series games. When it counted the most, Reggie Jackson produced the most.